While fentanyl and other deadly opioids continue to grab headlines and take lives, crystal methamphetamine remains one of the most prevalent drugs on Alberta streets. Even as police ramp up efforts against the deadly painkillers, crystal meth remains squarely in the crosshairs of law enforcement, says Staff Sgt. Cory Both, who oversees the Alberta Law Enforcement Response Teams' Medicine Hat organized crime and gangs unit. "We could double our team and still have work," Both said in an interview with CBC Radio's Edmonton AM. "There's that much of it out there. "Our stats are high because there's lots of it out there, but also high because we're focusing specifically on that drug." In the 2017-18 fiscal year, meth accounted for 40 per cent of the drugs seized by ALERT across the province, according to the agency's newly released annual report. Nearly $4 million worth of methamphetamine was taken off the streets in total, far outpacing the $1 million in fentanyl recovered through drug busts during the same time period. Cocaine was the second most prevalent drug, with more than $3.1 million seized. Annual meth seizures by ALERT have been steadily increasing, Both said, and the agency has responded by trying to dismantle the supply chain. Law enforcement agencies are doing their best to stretch resources to manage the drug crisis. "It's a triage situation, where you decide which group or person that's causing the most harm," he said. "And that's opioids and meth right now." While the police crackdown has escalated, so too has the number of people struggling with addictions. The number of people reporting crystal meth use nearly tripled in the past five years, according to data provided by Alberta Health Services. In the 2017-2018 fiscal year, 7,962 people who sought AHS addiction treatment reported they had used meth within the previous 12 months. Nearly 3,000 of those new users sought help in Edmonton alone. 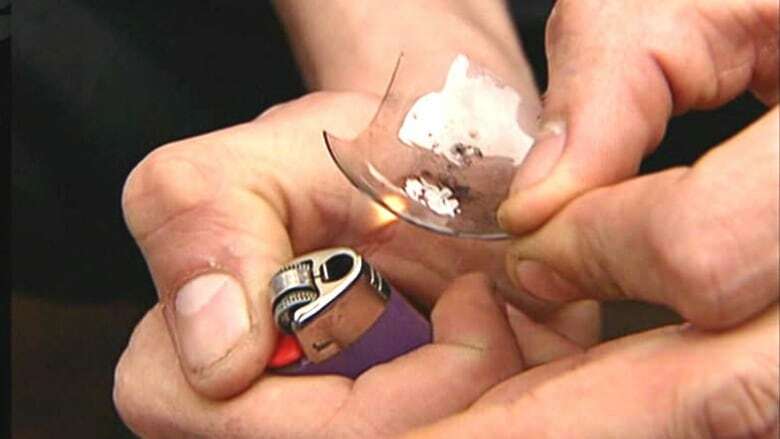 Five years ago, fewer than 3,000 people across the province sought treatment for meth addictions. The highly addictive drug is a scourge on Alberta communities, Both said. Areas where meth use is prevalent experience increased crime rates as users suffering psychosis, paranoia, hallucinations and aggression become desperate to feed their addictions. "It's really causing a lot of collateral damage in the community, as far as meth users and dealers trying to support their habits." Meth became a concern for Canadian law enforcement in the early 2000s. The drug arrived relatively late in Alberta, Both said. Police in the province anticipated its arrival, but the rapid proliferation of the drug — and its sudden grip on addicts — was disturbing, he said. "We really felt like the storm was going around us, but for whatever reason in 2014 it really caught on," he said. "We couldn't avoid it forever. "I think we seized more meth in 2014 than we had during the entire previous decade, and it just continued to skyrocket from there." Since the drug first took hold in Alberta, black market wholesalers have taken the place of small clandestine labs, Both said. There is a constant cheap supply of the drug being funnelled into Alberta. Even smaller centres such as Medicine Hat are targeted by dealers — usually by smaller crime syndicates working in collaboration with dealers in larger cities. Organized crime is responsible, Both said, but tracking the supply chain has been difficult. "I don't think anyone is really nailing it down," he said "Wherever it's coming from, they have the capacity to make very good quality product, in very large quantities." "It's indicative of super-lab-type facilities, whether it's secreted somewhere in our province, out west in the Lower Mainland or quite possibly from the Mexican cartels." Both said law enforcement officers need to collaborate with social agencies to try to break the cycle of addiction and tackle drug crime "at its root." "Right now, law enforcement is dealing with the symptoms of society's ills, and I don't think we can charge our way out of this," Both said.